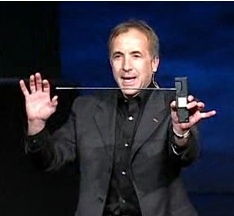 Michael Shermer is the founder of Skeptic magazine and the author of several books. He’s quoted often in Dawkins’ The God Delusion. He’s also rather a nice chap. I know this because a few years ago he was cycling high up in the Tuscan hills above Cortona and had a puncture, and I happened to pass by and give him a lift down to his hotel, so got a chance to chat to him. OK – enough name-dropping. The point of this post is that he gave a splendid talk at TED, which is great fun and definitely well worth 17 mins of your time. You can watch it or download a higher-resolution version here.